When Secretary of State Mike Pompeo engaged in a full day of denuclearization talks with North Koreans in Pyongyang Saturday, the top North Korea negotiator suggested that the secretary might have lost sleep over their dinner conversation Friday, and both sides expressed the desire to clarify some things in their conversation. 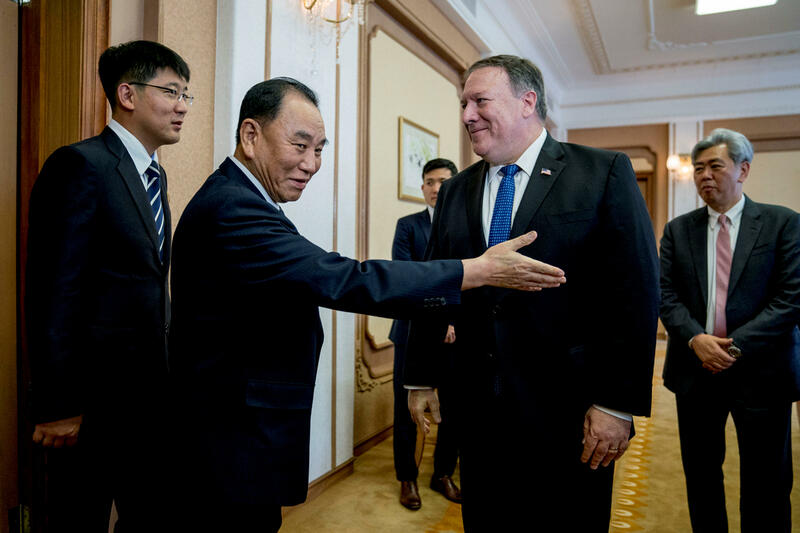 "Thinking about those discussions you might have not slept well last night," Kim Yong Chol said to Pompeo, in reference to their close to three-hour meal the night before in which, he said, the two discussed "very important matters." Kim also indicated that their face-to-face meeting may not have drawn the two countries any closer to achieving the stated end goal of denuclearization of the Korean Peninsula. He also maintained a skeptical tone, declaring that he had some things "to clarify" during their meeting. Kim provided no further detail, though. Pompeo, who had called the U.S.-North Korea relationship vital "for a brighter North Korea," responded in kind. "There are things that I have to clarify as well," Pompeo said. "It's a combination of Kim Yong Chol's unique sense of humor, typical Korean small talk about health especially when you reach the age of an "elder," and trying to throw a jab, to posture, and give Pompeo a hard time," explained Duyeon Kim, a visiting senior research fellow at the Korean Peninsula Future Forum in Seoul. After the comments about his troubled sleep, Pompeo sought to redirect the conversation toward the substance of their meetings. "We did have a good set of conversations yesterday, I appreciate that, and I look forward to our continued conversations today as well," Pompeo said. North Korea experts say that the noncommittal language from Kim indicates that there is still work to be done to bridge the gaps between the two sides on working toward denuclearization of the Korean peninsula. The comments should not be seen as an effort to derail the early-stage negotiating process, but they do show how far the U.S. side is from understanding what the North Koreans want and how to move the talks forward. And at this stage, North Koreans are stubborn, experts in the region contend. "I wouldn't raise eyebrows over this. The thrust is the Americans don't seem to get the point that this dialogue is not just about denuclearization‎, and that things haven't gotten off the ground, might not yet even be on an active runway," said a former U.S. diplomat. "It's too soon in these talks for the lion to lie down with the lamb." American negotiators who have sat down with North Koreans in the past say it can take a long time to get to know their counterparts. Pompeo has been working on the relationship with the North. He has now visited Pyongyang three times this year, and he welcomed Kim to New York and Washington earlier this year. The Trump administration has sped up establishing relations with Kim Jong Un's regime at a rapid pace. The U.S. has now set up a working group with an eye toward "directing the State Department's planning, policy, implementation and verification of our efforts to achieve the denuclearization of North Korea consistent with the Singapore Summit's joint statement," explained Heather Nauert, State Department spokesperson. The working group includes three State Department officials: Alex Wong, deputy assistant secretary for East Asian and Pacific Affairs; Ben Purser, deputy assistant secretary for International Security and Nonproliferation; and Mark Lambert, special representative for North Korean Policy. They'll coordinate department-wide efforts on the North Korea diplomacy. The lead negotiator is Ambassador Sung Kim, and the working group will support his efforts. He is currently the U.S. ambassador to the Philippines and has been deeply involved in U.S. negotiations with North Korea in the past. Andy Kim, the head of the CIA's Korea Mission Center, is also shepherding this process along at the highest level. He has been in every meeting that Pompeo has had with the North Koreans. Before Pompeo sat down with Kim Yong Col on Saturday morning he made a secure call to President Trump. National Security Adviser John Bolton and Chief of Staff John Kelly were also on the call. And although the State Department has stopped using the term "complete, verifiable, irreversible denuclearization," Nauert said that Pompeo was "very firm" in the meeting on Saturday. He was working on three primary goals: complete denuclearization of North Korea, security assurances, and the repatriation of remains of possible American prisoners of war from the Korean War. North Korea had promised to return those remains, but they have not yet done so.